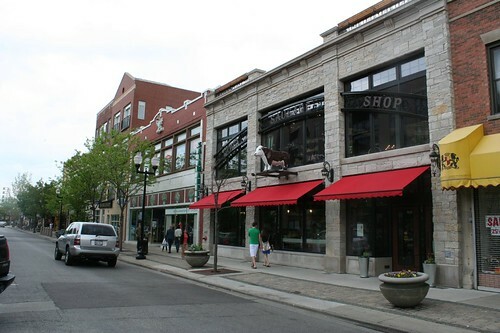 It’s not hard to walk the commercial streets of Chicago and find recently vacant storefronts, their former occupants victims of the Great Recession. The economy of the last few years has claimed several local and personal favorites. 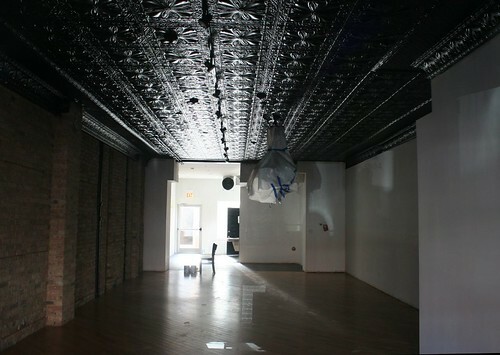 The little watch shop and jeweler that once operated out of the ground floor of this Lincoln Square flatiron, for example, disappeared in 2009. 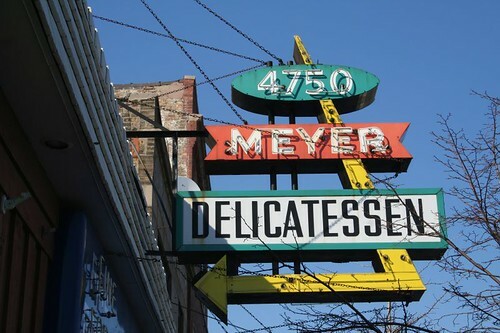 Around the corner, the long-standing Meyer Delicatessen vanished in 2008, along with its two fantastic neon signs. This story has a happy ending, though. The space has been completely remodeled by a boutique grocer, adding a second story and a handsome new facade. And inside, the mounted sign has returned, now hanging proudly at the head of a new staircase. 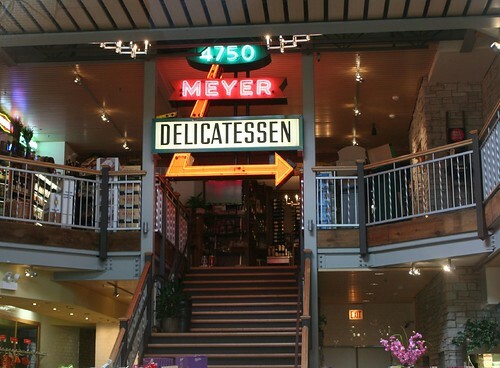 I nearly did a backflip when I saw it – it’s a wonderful repurposing of a wonderful bit of neon. My only complaint is that the store’s deli is actually to the left. And downstairs. 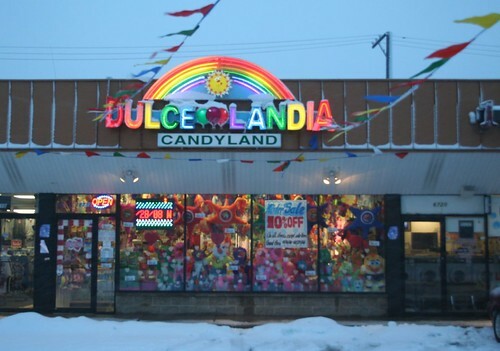 Perhaps my favorite back-lit plastic sign disappeared with the closing of the Rogers Park outlet of the Dulcelandia Mexican candy store, a local chain. 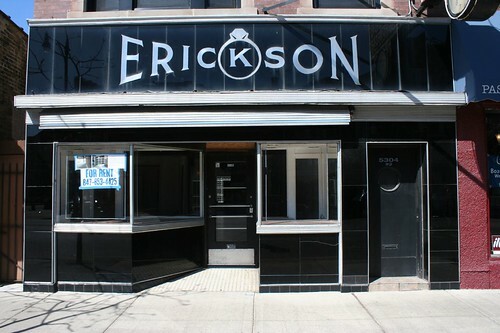 The most architecturally alarming loss is Erickson Jewelers. 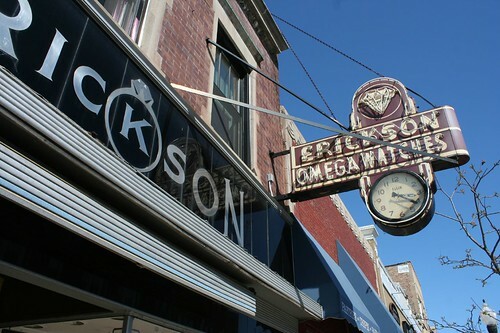 This Andersonville storefront features a sleek black Vitrolite facade, elegantly engraved with the company’s name and signature product, combined with a delightful neon sign and clock advertising Omega Watches. Dating from the 1940s, the renovation that created this sleek commercial space is sufficiently obscure that not even the AIA Guide can identify an architect or exact date. 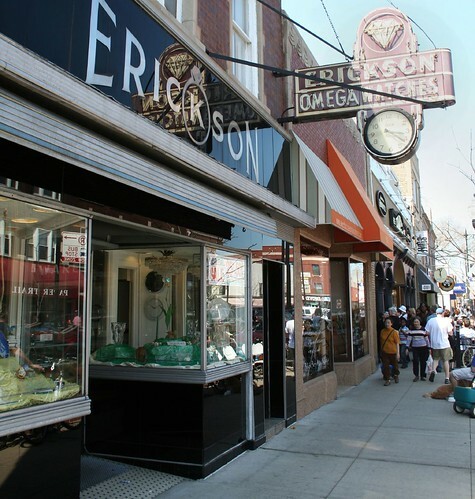 In business since at least 1924, Erickson Jeweler was still open in 2007, but closed by the end of 2009. Much to my regret, I never photographed the neon sign while it was in operation, and it would take an unusually enlightened and daring tenant to leave the business-specific facade intact. This entry was posted in Commercial strips, Vitrolite, Vitrolite Panels. Bookmark the permalink. Shame about the jewelery store, my folks moved up to the area in '73 and that's been one of the few constants in the area. Just walked by Erickson's jewelry store yesterday and there was some scaffolding up. I am curious and frightened to see if any changes are being made to the exterior. 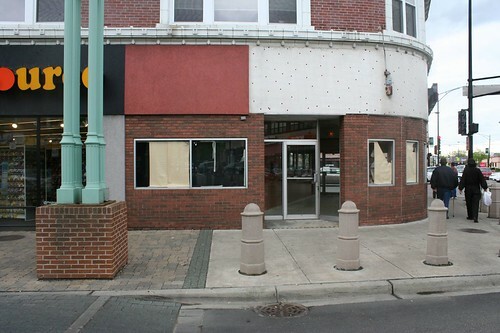 Also, the windows are now papered in brown to suggest that perhaps a new tenant is moving in. 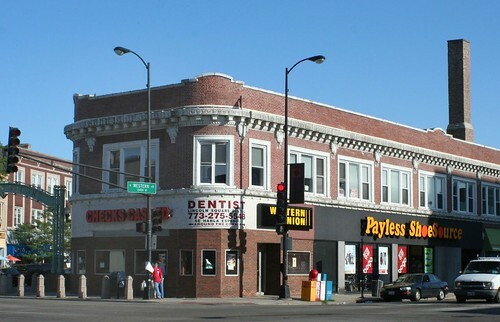 I think the existing facade could be preserved and still serve a new tenant just fine with some creative thinking. Its definitely an amazing in-tact facade. Yeah, I went by this evening and they've pulled off a single Vitrolite panel – definitely exploratory, very likely to see what's underneath so they can consider removal. I wonder if there's someone I can write to beg for preservation. It is insulting to read the speculations about this building which are completely false and an inaccurate representation of what is occurring at the building. 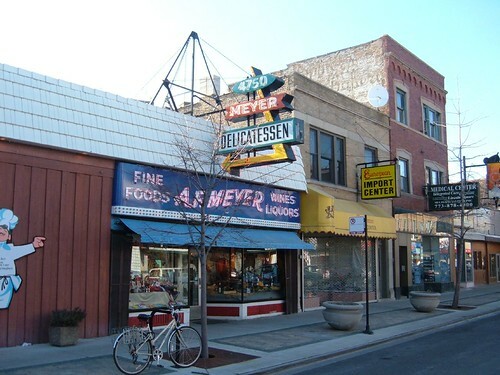 As the spouse of one of the owners who has been in Andersonville for almost 40 years, I would like to report the facts. A panel fell off in the middle of the night. Since our main concern is the safety of the community, we ordered scaffolding immediately in order to protect the community while we try to locate a replacement panel of vitrolite in order to preserve the historical integrity of the building. I assume that the exploratory and removal comments were made by a structural engineer after examining the facade and interviewing the owners. Your time would be better spent helping us locate vitrolite. We so appreciate the neighbors in Andersonville who know us and have been understanding and supportive during this time. I appreciate learning what's happening. It's great to hear that the intention is to preserve the existing facade – there's no word anywhere else about plans for the building.I have to say, though, that's just about the least insulting "insult" I've ever issued. Why so grumpy?? Haha owned. 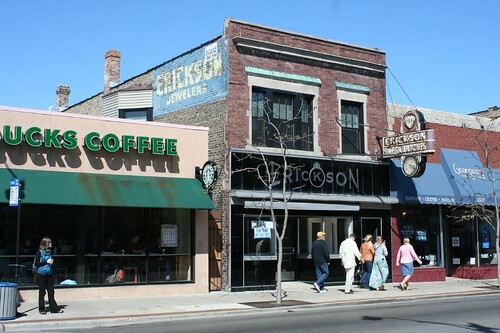 All I can say is that we in Andersonville care quite a bit about the history of some of these great buildings. I remember that there was a buzz on the street when the scaffolding went up. I'd bet the last thing the owners of the building want is people jumping to the wrong conclusion. If they were actually tearing down that beautiful vitrolite (or if people just thought they were) they would have an angry neighborhood on their hands, so I see why she is defending herself.Anyways, I can't wait to see it when it's newly restored! !